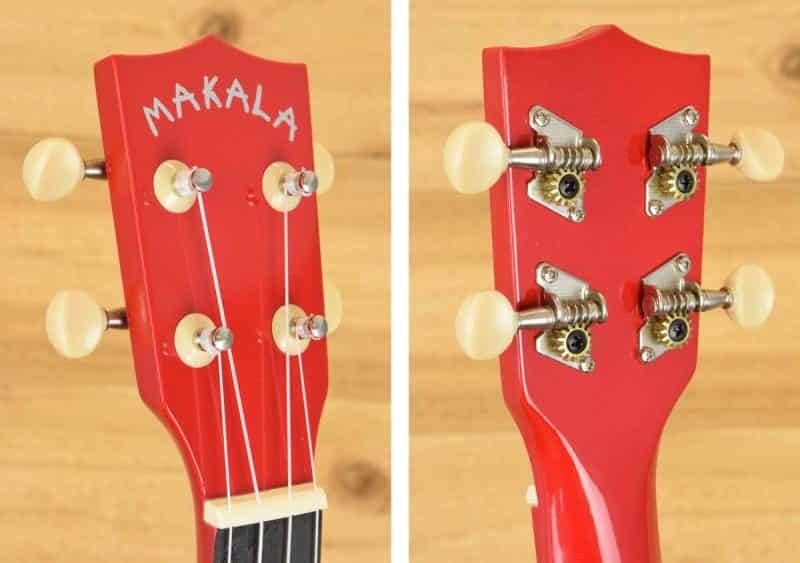 In this review, I’ll be taking a looks at the Makala Dolphin ukulele. Also known as the MK-SD, the Dolphin is part of Kala’s budget-friendly Makala brand. The Dolphin comes in a variety of colors and gets its name from the signature dolphin-shaped bridge. 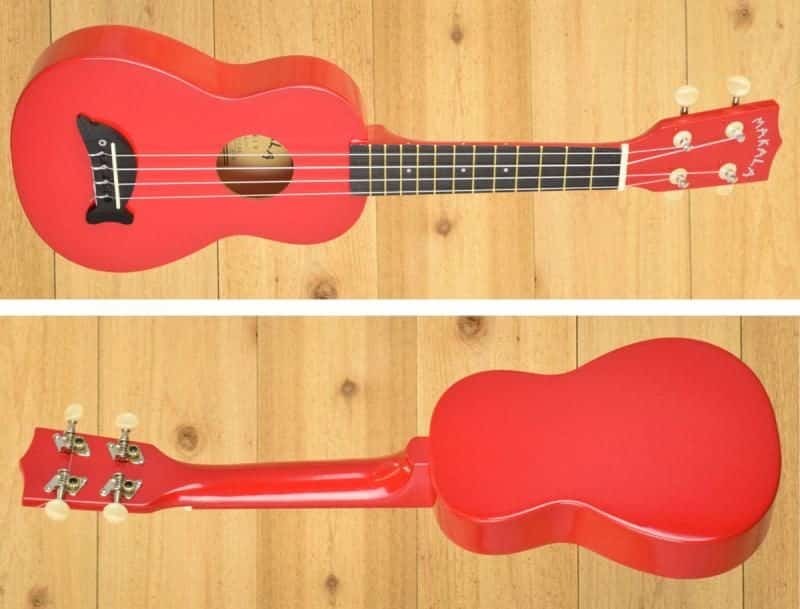 It’s affordable uke with a fun design, but is it right for you? Keep reading to find out. For this review, I purchased a brand new Makala Dolphin MK-SD/CAR (the CAR stands for “Candy Apple Red”). All impressions are based on the how the uke performed “out of the box” with no tweaks or adjustments. All pictures are of the actual ukulele I used for this review. My final verdict is that if you like the Dolphin’s unique design and interesting color options, it’s a reasonably good uke for the money. 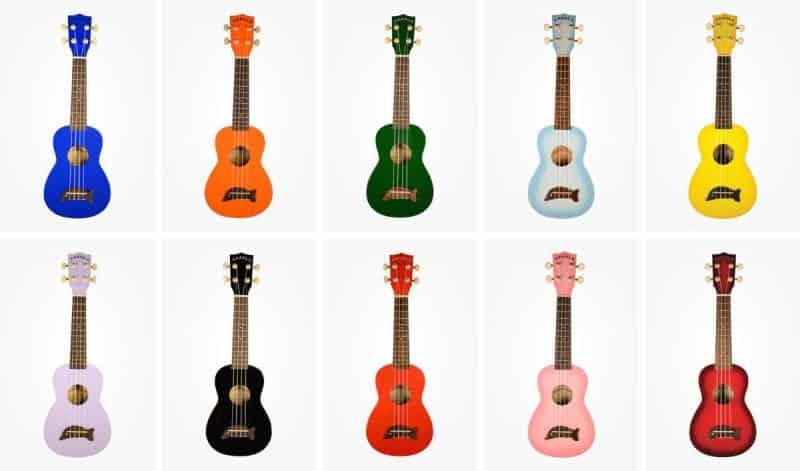 Players looking for a more “serious” beginner ukulele may want to consider other options. 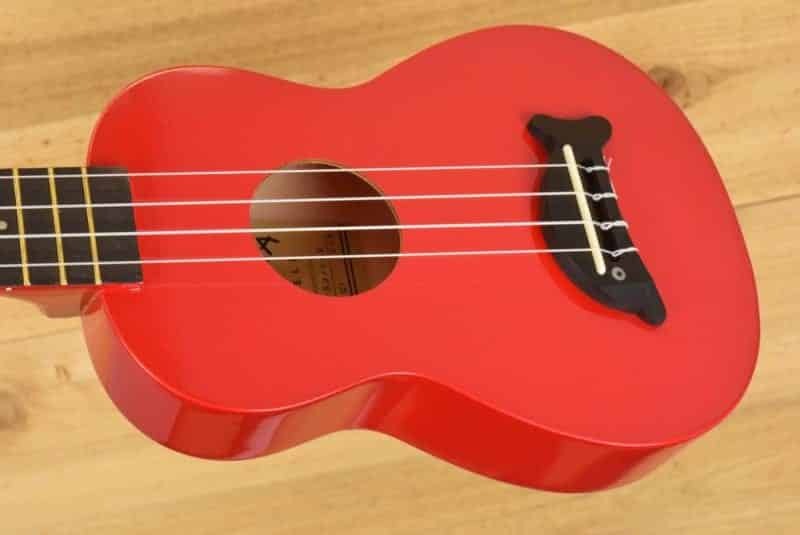 I recommend a few models at the end of this post, or you can read my article on the best beginner ukuleles. The MK-SD’s build quality is very good considering the price. It’s better than many ukes I’ve seen in this price range and far superior to the super cheap ukes you’ll find on Amazon for $20 to $30. The uke I tested for this review is in line with what I’ve come to expect from Kala, which is good quality at a reasonable price. The important stuff was all there: Straight neck, even fretwork, and decent playability. 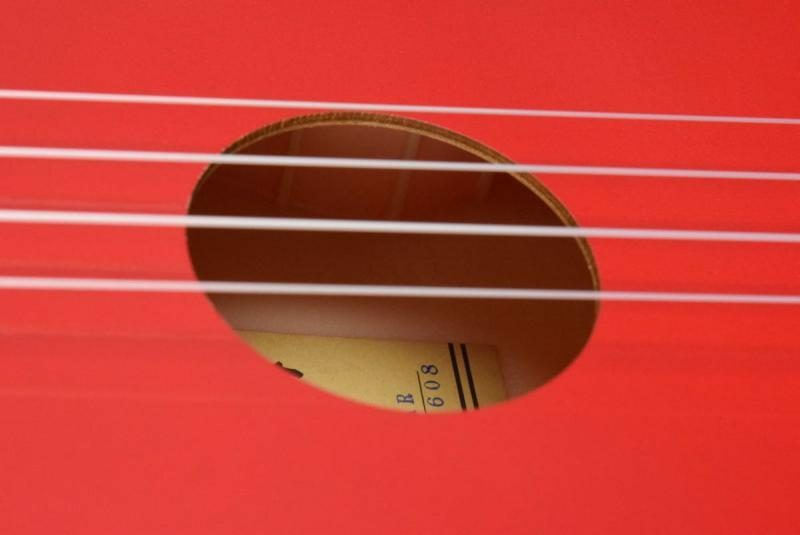 The detail work is surprisingly clean for a uke of this price, but it’s not flawless. There were a few minor imperfections here and there, but these issues were purely cosmetic and don’t affect tone or playability. One small issue I have with the Dolphin is the tuners. They work fine, but they have loose plastic washers on the top of the headstock that can occasionally vibrate when certain notes or chords are played. This is a small issue and it only happened occasionally on my uke, but it’s still worth noting. 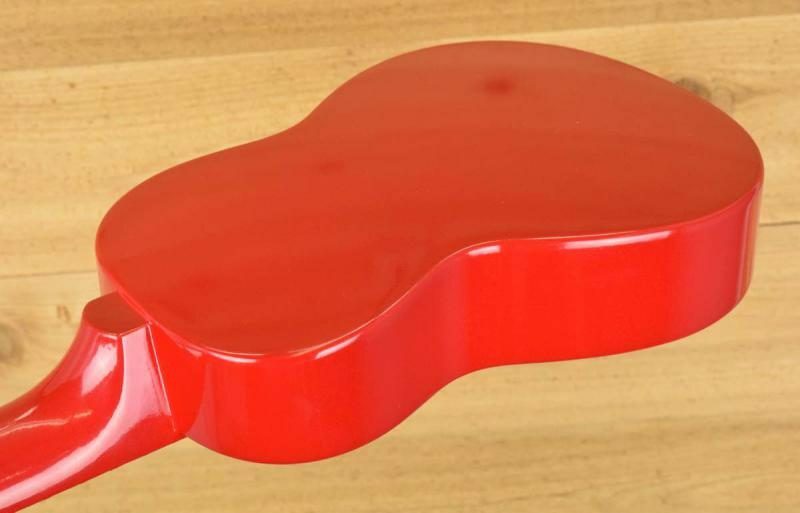 The bright “Candy Apple Red” finish was rich, deep, and uniform. Even though I prefer ukes with a more traditional look and finish, if you want something with a bit more flash may like the Dolphin’s bold color options. It’s important to remember that in the world of acoustic instruments, the Dolphin is a relatively inexpensive uke. If you’re looking for premium build quality, be prepared to spend a lot more. My MK-SD plays well right out of the box. The action (string height) was low enough that the uke wasn’t a struggle to play. Even though the action was a bit high for my tastes, most folks would be able to play this uke without any major issues. The action could be brought down with a bit of basic setup work, but that sort of thing may go beyond the skill and comfort level of a beginner. You could always pay to have it done, but the money you’d spend having a music shop do the work would probably be better spent simply upgrading to a slightly more expensive ukulele. I didn’t notice any buzzing or high frets as I played up the neck, and the notes consistently rang out clear and clean. 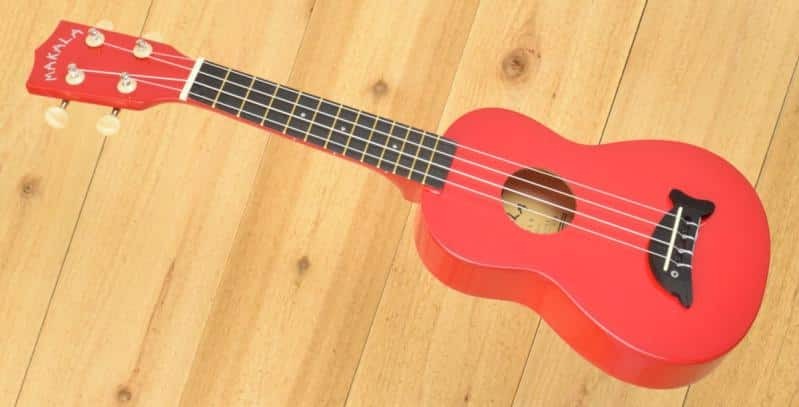 The Makala Dolphin is a soprano sized ukulele, which is the smallest of the three primary ukulele sizes.​ Some players may find the soprano a bit too tiny to play comfortably and may want to consider the larger concert or tenor sizes. A budget uke like the Dolphin will never have the buttery-smooth action of a more expensive instrument. Improved playability is just one of the many reasons people pay hundreds (or thousands) of dollars for a higher quality uke. The MK-SD is a decent-sounding uke, and I found myself liking the tone more than I expected. It didn’t blow me away, but it certainly didn’t sound bad. While the Dolphin sounds better than the super cheap ukes you’ll find online for $25, its tone is thinner and quieter than some other ukes I’ve played in this price range. I also feel like the Dolphin has less sustain and resonance than Kala’s other budget-friendly instruments like the KA-15S. The Dolphin’s composite back and sides don’t do it any favors, and the uke feels very dense and heavy for its size. In my experience, heavily built instruments always sound less rich and lively. 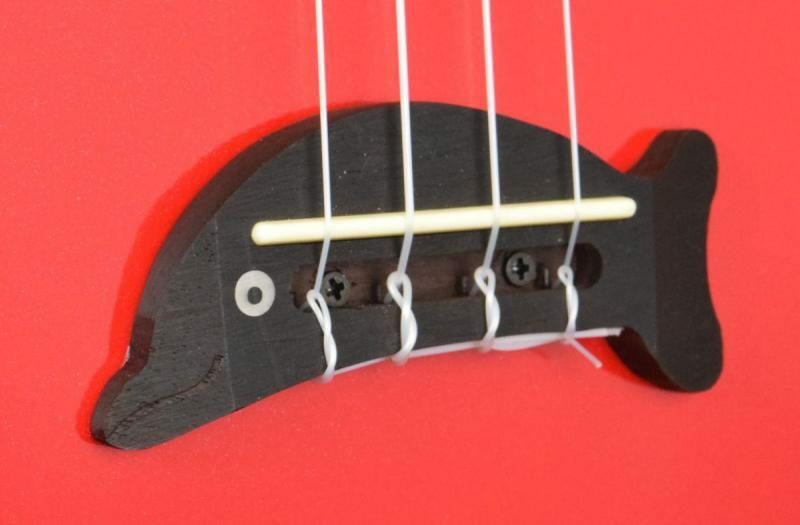 Like all Kala ukuleles, the Dolphin comes with Aquila Nylgut strings. I like these strings a lot more than the cheap nylon strings often found on budget ukes. 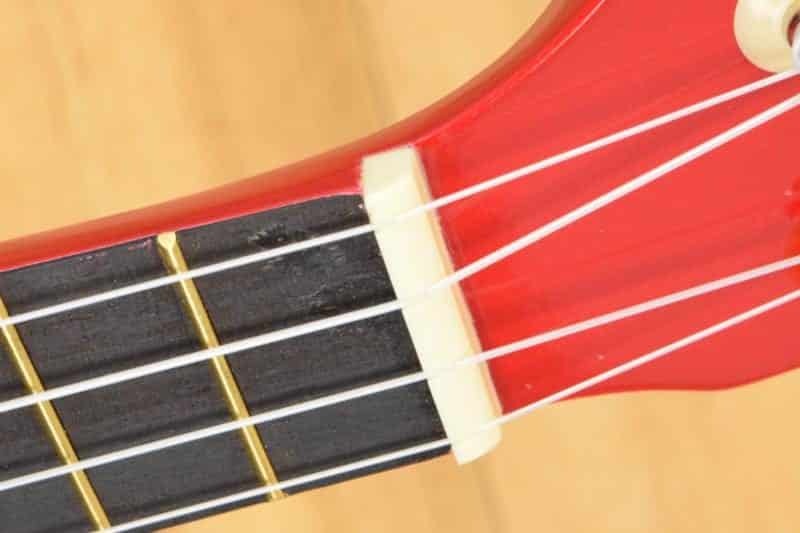 The Dolphin uke has a laminated mahogany top, which is very common on budget-priced ukes. 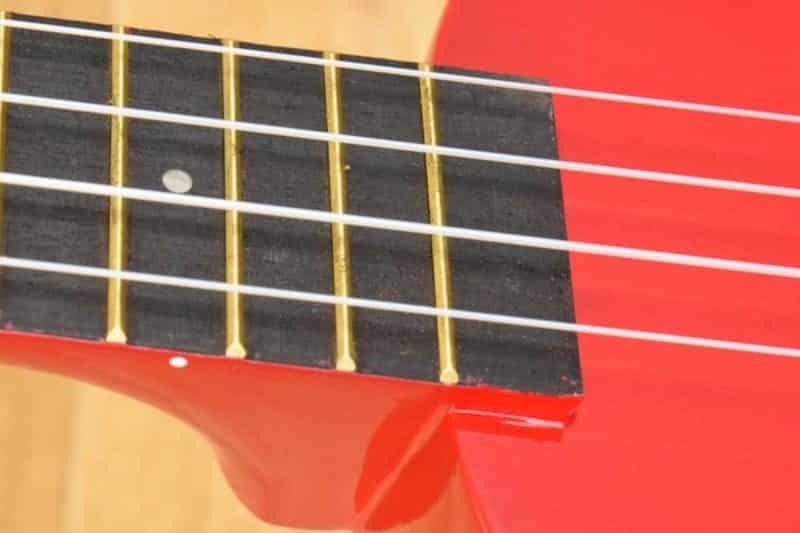 Ukes with a solid top will generally sound better, but they also tend to cost quite a bit more. The back and sides are made of a single molded piece of material. It looks and feels like plastic, Makala refers to it as a “composite.” I’m guessing this because the marketing folks at Kala thought it sounded better. The neck is mahogany and the fingerboard and saddle are rosewood–all fairly standard materials for acoustic instruments. The nut and saddle are plastic. 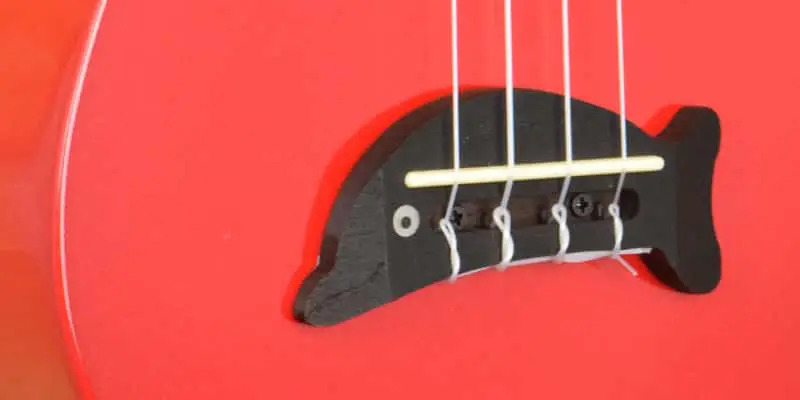 This is common on more affordable instruments, but I think the synthetic bone found on slightly more expensive ukuleles tends to offer increased sustain and volume. The frets (metal bars on the neck) are made of brass. 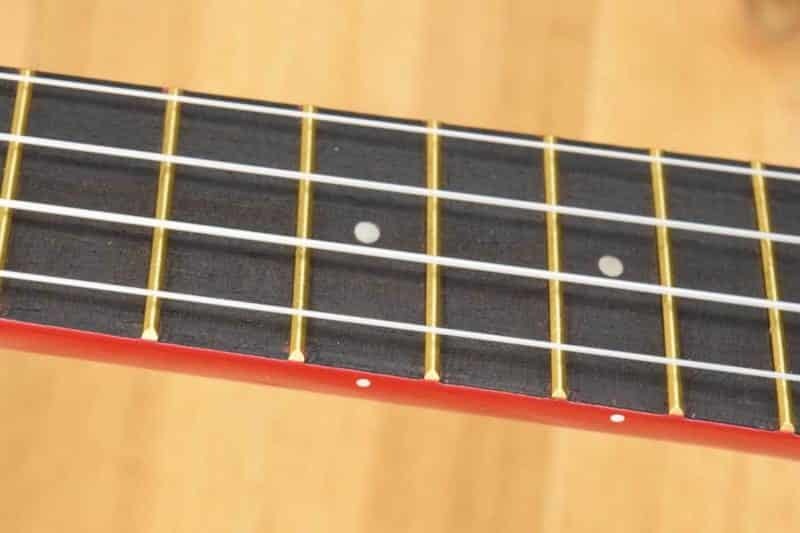 While I don’t like to see brass frets on steel-string instruments like guitars, uke strings are so soft that it’s not something I worry about. Kala makes a nearly identical ukulele called the Shark. The only difference between the two ukes is that the Dolphin has a dolphin-shaped bridge while the Shark has a shark-shaped bridge. The Makala Shark is the exact same price online, so I guess it just boils down to which kind of sea life you prefer! The Shark is available in many of the same colors as the Dolphin; I’ve posted a few examples below. While the Dolphin’s tone and playability won’t thrill serious players, it’s still a fun, well-built uke. If you like the quirky design and wide array of color options, it’s worth a look. Players seeking an instrument with a bit more substance may want to consider the KA-15S (also from Kala) or the highly-rated Donner and Hricane ukes in the table below. These options are about the same price and offer a number of upgrades over the Dolphin that are well worth the investment.